Flicker Alley has announced the Blu-ray/DVD releases of two very special films, TOO LATE FOR TEARS (1949) and WOMAN ON THE RUN (1950). 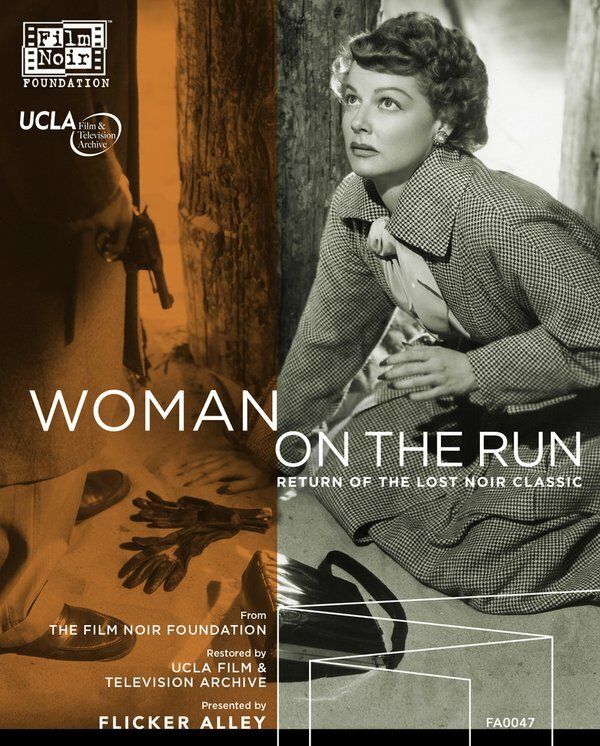 These film noir titles, which were only available in terrible prints for many years, were restored by UCLA in conjunction with the Film Noir Foundation. The films are being released by Flicker Alley in dual-format Blu-ray/DVD editions. 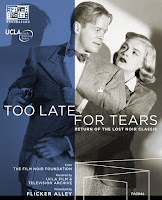 TOO LATE FOR TEARS was an opening night film at the 16th Annual Noir City Festival in Hollywood in 2014 (reviewed here), and WOMAN ON THE RUN played on opening night of the 2015 festival (reviewed here). The Flicker Alley site has a release date for both films of April 12, 2016. Amazon gives the date of April 19th. March 2016 Update: Amazon has updated the release date for both films to May 17, 2016. The sets sound like very high-quality releases with extras on a par with releases by the Criterion Collection. 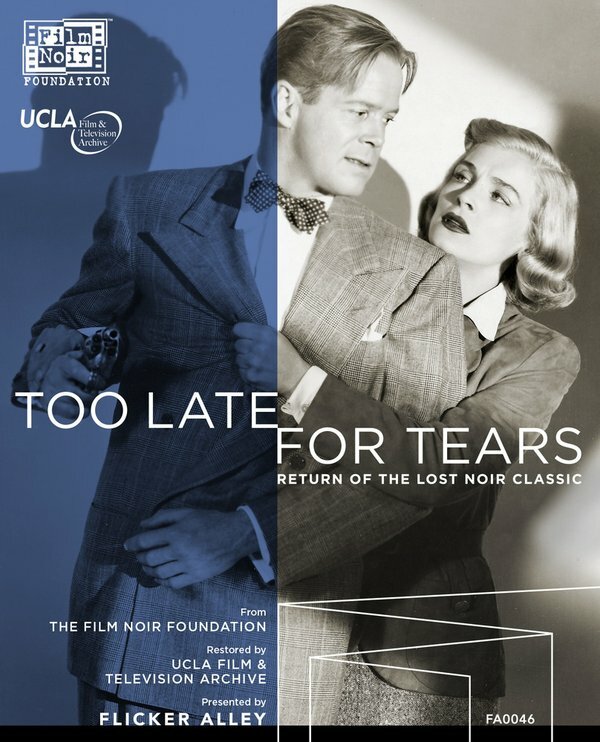 TOO LATE FOR TEARS has a commentary track by Alan K. Rode of the Film Noir Foundation. It also includes a "making of" "mini-documentary" with Eddie Muller, Kim Morgan, and Julie Kirgo; and a 24-page souvenir booklet which includes an essay by Brian Light. 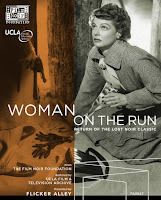 WOMAN ON THE RUN has a commentary by the Film Noir Foundation's Eddie Muller. It also includes "mini-documentaries" on the making of the film and its restoration; the featurette on the Noir City Festival; and a 24-page souvenir booklet which includes an essay by Muller. These films are the beginning of a new venture between the Film Noir Foundation and Flicker Alley. According to the Film Noir Foundation website, "The release of more FNF titles will depend largely on the sales numbers of these first two discs. REPEAT PERFORMANCE (1947), HIGH TIDE (1947), and THE GUILTY (1947) are likely candidates for later release, as are some of the Argentinian noir films recently resurrected by the FNF." I inserted links to my reviews of the possible future releases into the Film Noir Foundation's statement. These are all films which very much need to be out on DVD, most especially REPEAT PERFORMANCE, one of my favorite films of the last few years. TOO LATE FOR TEARS and WOMAN ON THE RUN are both marvelous films which are "musts" for any film noir collection, and with the promise of more such films in the offing, hopefully all film noir fans will support both releases! March 2016 Update: These editions of TOO LATE FOR TEARS and WOMAN ON THE RUN will be released in the UK this June by Arrow Films. Here are the links for WOMAN ON THE RUN and TOO LATE FOR TEARS. May 2016 Update: Here is the review of the TOO LATE FOR TEARS Blu-ray/DVD set, and here is my review of WOMAN ON THE RUN. Very excited about a possible Blu Ray of THE GUILTY a terrific Noir. The Film Noir Foundation do great work. has a sensational John Payne performance. Glad I could share this good news, Jerry and John! We'll hope that these take off and we're able to see even more great rareties via this line in the future. This is terrific! I saw TOO LATE FOR TEARS on TCM this past 'noir summer' and loved it. One of my first introductions to Lizabeth Scott, too. Thanks for sharing the news with us.